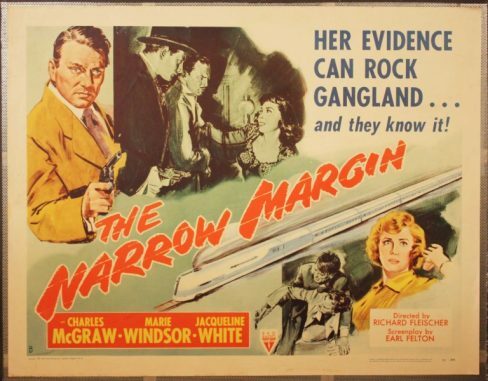 Kennington Noir Presents The Narrow Margin (1952) directed by Richard Fleischer. October’s Noir is a suspenseful B picture set entirely on and around a train (made before the Hitchcock picture with a similar theme). 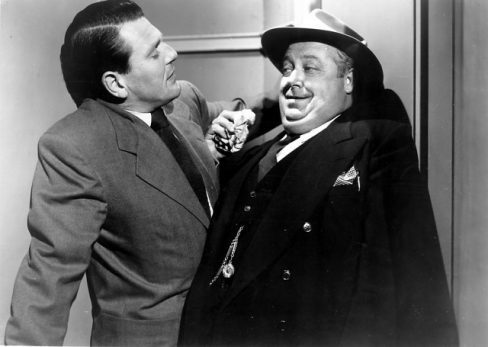 Charles McGraw plays a police detective hired to transport the widow of a murdered gangster (Marie Windsor) cross-country to California so that she can testify about her husband’s murder before a grand jury. Also on the train, and following alongside, are mobsters who will do whatever necessary to make sure she doesn’t reach Los Angeles. McGraw is Mr. Tough-as-Nails as always, and noir queen Windsor is at her bitchiest. The setting on the train gives the whole film a claustrophobic quality that adds to the suspense. Made in 13 days in 1950 for RKO, but with release delayed until 1952 due to the procrastination of studio owner Howard Hughes, this classic noir is now held in high regard by film buffs.